A handrail or grab bar should be of a diameter/width and strength so that it may easily be grabbed and used as a support (Fig.3.1a). If handrails or grab bars are mounted adjacent to a wall, clearance space between the walls and the grab bar should be provided. Handrails should have continuous gripping surfaces, without interruptions or obstructions that can break a hand hold. 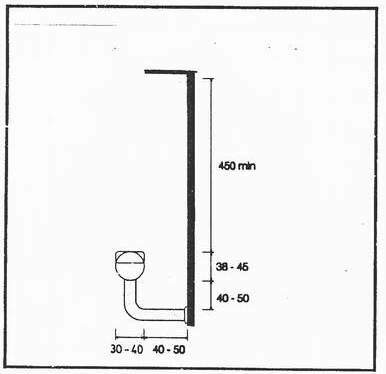 If handrails or grab bars are mounted in a recess, the maximum depth and minimum height of the recess must be considered (Fig.3.1a). A small plate in Braile should be provided at the beginning and at the end of each handrail/grab bar to indicate its position to persons with visual impairments. Handrails/grab should be in a colour that contrasts with the surrounding area. Grab bars should be installed to resist a force of at least 1.3 kn applied vertically or horizontally. Figure 3.1a : Handrails/Grab bars.